Ever since I first read about them at the age of around ten, I have been fascinated by the fragile and exquisite beauty of the Fabergé eggs. Fabergé jewelled eggs were created by Peter Faberge between 1885 and 1917; the most famous of these eggs were made for the Russian Tsars, Alexander III and Nicholas II, who gifted them to their wives and mothers at Easter – these are known as the Imperial Fabergé eggs. The House of Fabergé made around 50 of these eggs, of which only 42 survive today. 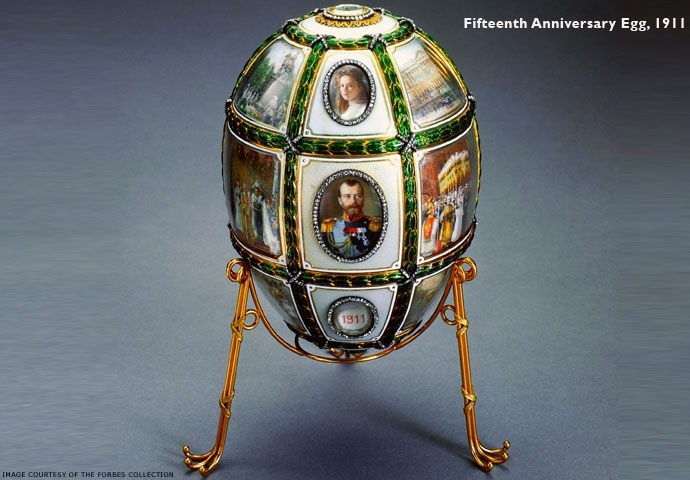 The very first Fabergé egg was created in 1885 and commissioned by Tsar Alexander III for his wife. 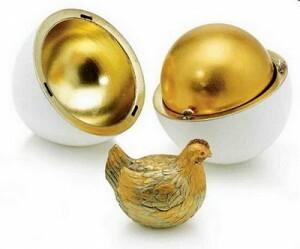 It is known as the “Hen Egg” and was created in gold with an opaque white enamelled shell – this opens to reveal a matte yellow-gold yolk, which in turn opens to reveal a multi-coloured golden hen. Amazingly the hen opens as well and she reveals a tiny diamond replica of the imperial crown, from which a small ruby pendant was suspended – unfortunately both the crown and the pendant have been lost. 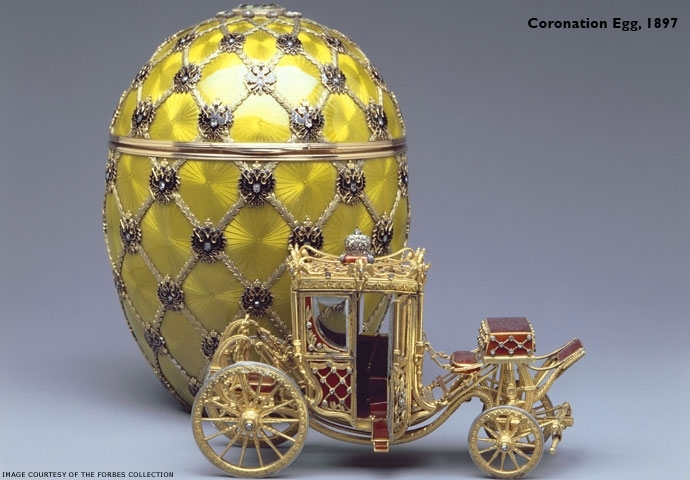 The royal family loved this little Hen egg so much they commissioned a new egg every Easter and gave Fabergé free rein to create what he wanted; the only stipulation was that each egg had to contain a “surprise.” So kind of like a dream job for any jeweller I would imagine! This was made in 1901 for Nicholas II of Russia as a gift for his mother. 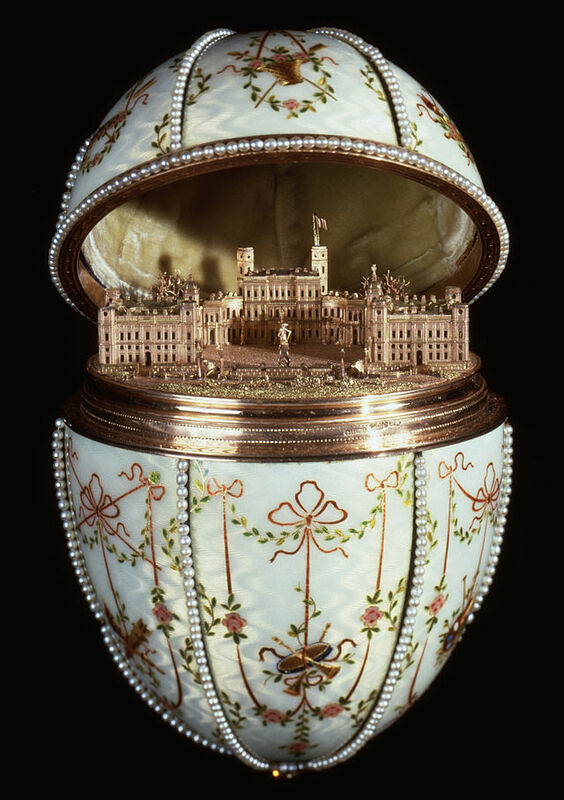 The bejewelled, enamelled egg opens to reveal a tiny gold replica of the palace of Gatchina, which was his mother’s winter residence. 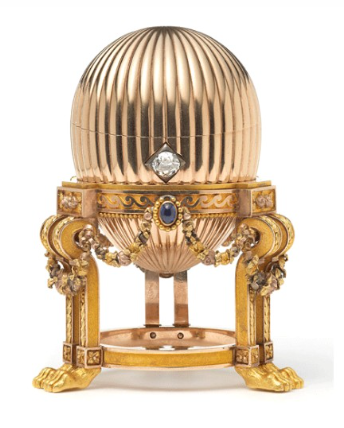 The egg is crafted from gold, enamel, silver gilt, diamonds, rock crystal and seed pearls. “House of Fabergé – Gatchina Palace Egg – Walters 44500 – Open View B” by House of Fabergé – Walters Art Museum: Home page Info about artwork. Licensed under Public Domain via Wikimedia Commons. When I did my OE some of my favourite things were the equestrian statues in the many palace grounds I visited, so this egg was always going to appeal to me. It was created by Fabergé in 1910 for the last Tsar of Russia, Nicholas II and was a gift for his mother. 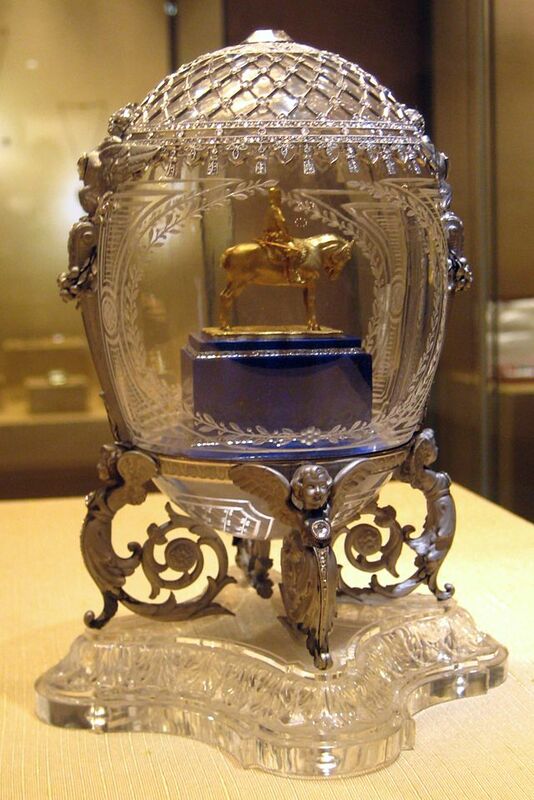 “Alexander III Equestrian Faberge egg 01 by shakko” by shakko – Own work. Licensed under CC BY-SA 3.0 via Wikimedia Commons. This gorgeous thing is carved out of rock-quartz crystal with platinum trelliswork on top – which I LOVE – I don’t think platinum trelliswork is used enough these days – do you?! Anyway, it also has a large diamond engraved with the year “1910” on top of the egg which is set in a band of small roses, with a rosette border of platinum acanthus leaves. The two platinum double-headed eagles on the sides of the egg have diamond crowns – oooh, I LOVE diamond crowns! This egg’s “surprise” is the golden replica of a statue of Tsar Alexander III on horseback, standing on a nephrite base and embellished with two rose-cut diamond bands. It is also engraved with Fabergés signature. The egg is supported by platinum cherubs coiled into position on a base of crystal. Exquisite. This stunning bejewelled Fabergé egg was created in 1897 to commemorate Tsaritsa, Empress Alexandra Fyodorovna’s coronation. The egg is made from gold with translucent lime yellow enamel and a beautiful field of starbursts which reference the cloth-of-gold robe worn by the Tsarina at her coronation. A large portrait diamond is set in the top of the egg and this stonker of a diamond is surrounded by ten brilliant-cut diamonds. The even cooler thing about the large diamond (other than its size!) is that if you look into the table (i.e. the flat part on top!) you can see the monogram of the Empress. This egg’s “surprise” is fitted inside a velvet-lined compartment and is an exact replica of the eighteenth-century Imperial coach that carried Tsarina Alexandra to her coronation. The red colour of the original coach was recreated using strawberry-coloured translucent enamel. It has another fabulous large diamond on the top and the windows are made of engraved rock crystal. The tyres are platinum, decorated with a diamond-set trellis in gold and the doors have an Imperial eagle made out of diamonds. It even has C-spring shock absorbers and a tiny folding step-chair! Unfortunately a few things are missing from this egg – it originally had an emerald or diamond pendant that hung inside the coach and it had a glass-enclosed jadeite stand for the display of the carriage as well as a stand made of silver-gilt wire. Such a shame these things get lost or stolen over the years. So what’s the value of a Fabergé egg you ask? Good question – let’s just say that a VERY lucky gentleman bought this egg at a jumble sale for $14,000 (which actually seems like a LOT to shell out at a jumble sale to me) – he was planningto sell it for scrap metal but overestimated its value and couldn’t find a buyer. 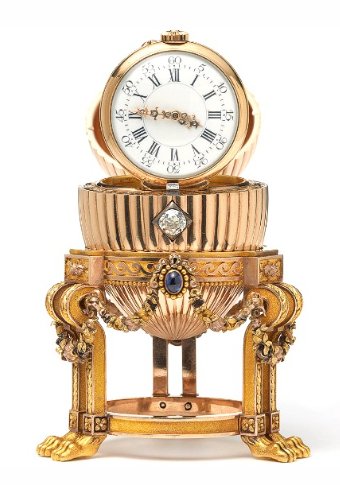 In desperation he typed in the name that appeared on the face of the clock and long story, short – it turned out to be the missing third Fabergé Imperial Egg and was subsequently sold for $33 million! So in summary – the intrinsic value of the Fabergé eggs is not actually that much – the intrinsic value of this one was pretty much what he paid; essentially what you are paying for with a Fabergé egg is the name, the craftsmanship – and, of course, the history or provenance behind it. So what do you think? Are you as intrigued by the fabulous craftsmanship and sparkly beauty of these Fabergé eggs as I am? Posted on April 20, 2019 April 20, 2019 by MumptyStylePosted in Mumpty StoriesTagged Easter, Easter eggs, Faberge, House of Faberge, Imperial Faberge Eggs, Tsars of Russia.